A long while back, when I was just a wee lad, I met a charismatic singer-songwriter by the name of Jason Steady. I saw him perform at the Cog Factory a couple of times, and by the third time I was hitting a drum while he sang his kooky quirky songs. Over the next few years we were in about a dozen bands together, then the wheel of fate found us drifting apart. Cut to two years ago, when we once again found ourselves riding in a van and swapping dumb stories. I had just released “Hello, I’m Chris Twist,” and this time Jason was hitting multiple drums as I sang my kooky songs. Jade and Knife were there for some of them, too! Hi Jade! Hi Knife! We did a couple of tours, camped in the desert and the woods and the high plains, listened to lots of Gram Parsons, and started making plans. 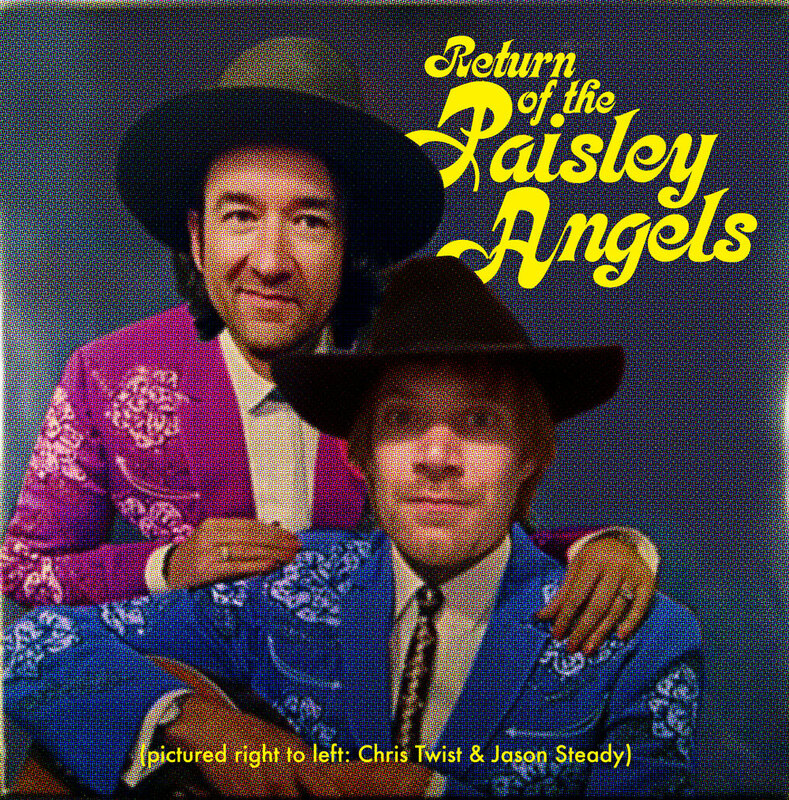 Cut to now, as we release The Return of the Paisley Angels, a collection of songs of wanderlust and wonder, written and performed by both of us, and a corresponding tour that will take us to many of our favorite places and a few soon to be faves as well. Here’s hoping to see you out there on the ol’ dusty trail! If you’re like me, you remember all the things that I remember, including the infamous (unfamous?) Steady Twistin Tour of earlier this year. The plan was for me and all around good guy pal Jason Steady to do a camping trip/tour from Omaha to California and back, sleeping in makeshift bunkbeds built into the back of his Chevy Working Man van. It almost worked out exactly as planned, except that we picked up a guitar slinging gal named Jailbird Jade along the way. We had lots of fun and made lots of memories and you have them too, right? Well wouldn’t you believe it, we are at it again, this time we already know that Jade will be in the group, but who will be playing bass by the end of the adventure? Maybe you! Check the shows page to see where we’ll be playing, or, if you’re reading this in the distant future, where we played! Slushy is a colorful cast of characters. Sometimes. Sometimes it’s a monologue. Who is Slushy? Who is in Slushy? Who was in Slushy? Who should be in Slushy? These are the questions on the nation’s most in-demand lips. Let’s see if I can provide some answers. Hi, that’s me. I started writing and recording a lot of songs when I first moved to Chicago, then started playing those songs live solo as Kramer Versus Kramer, then found a bunch of dummies to play them with me, then changed the name of the band to Slushy, and that’s the whole story. I write or co-write all the songs, sing the songs, play many or all instruments on recordings, write emails, draw monsters, and sleep in a basement that is full of junk musical equipment. Sometimes my pals play with me too. In the world of very cool news, Slushy has been invited to do a residency at the Owl in Logan Square, the premier late-night bar in the neighborhood. Running from September 17 through October 8, I’ll be spinning the best bubble gum, doo-wop, soul, and rhythm & blues records from 10 pm to 4 am, plus giving a special live performance each night at 1 am. This is how you kick off a month-long party. “Slushy Presents: NUGGISH – Artyficial Originals from the First Slushydelic Era: Vol I” is the brand new, unofficial Slushy album. Tripp Tapes is putting out 100 copies on cassette, and I’ll be performing a selection of the songs for the first night of the residency. Last month I had the pleasure to perform alongside DR. PAUL, wearing a dinosaur mask and rattling a tambourine. DR PAUL rules. And he reminded me that in 2002, I had the idea to record an album under the name FUTURE BOY. I wrote a few songs, never recorded them, and then forget how to play them and all about the project. But DR PAUL changed that, so I wrote a new batch of FUTURE BOY songs! Once again, Tripp Tapes is putting out 100 cassettes, available only at this show, and there will be a live performance by FUTURE BOY himself. BIG is a new band comprised of James Swanberg and Chris Kramer. James sings, Chris plays acoustic guitar. This will be our first ever show. Maybe we’ll have a tape out on Tripp Tapes??? James will be co-DJing, and all his records are as good as or better than mine. Okay, I can’t tell you just what will be going down for the last night of the Slushy Owl residency, but it may include cake, pony rides, clowns (not the scary kind), fire eaters, lots of guitar solos, celebrity lookalikes, those drawings where it’s two images in one depending on how you look at it, kissing booths, another BIG performance, Charo the “cuchi-cuchi” girl, mandatory Simpsons quotes, and live owls flying around the bar all night. Expect at least one of those. Slushy performing “Candy” live on the Chica-Go-Go Show! Thanks to Miss Mia and Ratso for having us, and to Max from The Lemons for filling in on bass! Halloween is coming and Slushy is playing two or three very special shows. 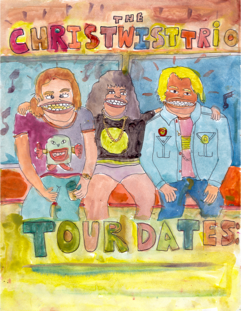 First, a one time only lineup of Chris and some special guests are playing a house party on Saturday October 29! Covers! Guitar solos! Ebriation! Covers! 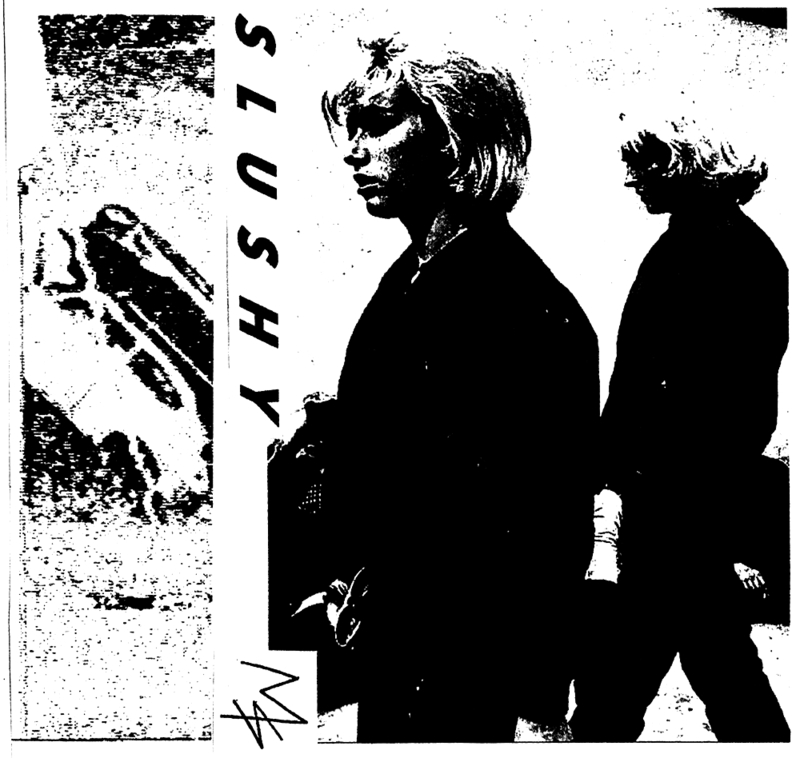 Then Monday October 31 Slushy and Chicago’s own Uh Bones are playing a feedback-drenched set of songs from the first two Velvet Underground albums at The Exit, Chicago’s oldest punk bar. And speaking of playing sets as the Velvet Underground, we may just crash the Halloween show at Crown Tap Room and do a second set there. Only time can tell. She’s Going Away Now is a song by Slushy written in March of 2011. It features the chords Bb, C, F, G and D. It does not have a guitar solo. It does have some good changes. Shimby recorded She’s Going Away Now for the first Slushy LP, “Pastime Gardens”. It sounds great! This song about about a young woman who is really going places. Baby with the Big Tape Head is a pop song appearing on the Slushy Yellow EP. It was written by Max Epstein and originally performed by Boshus as “Baby with a Big Head”. The Slushy version features new lyrics and copious amounts of synthesized tape delay, earning the song its expanded title. The tune was later recorded by The Lemons under its original name for their debut cassette tape, “Hello, We’re The Lemons”. Baby with the Big Tape Head uses the chords E, A and D.